Our Barbers don’t sing. They don’t clap. And they don’t do lunges – unless it’s their day off. Our Barbers are a cool cutting crowd of blokes and babes with one solid agenda: to groom you, good & proper. At Sorbet Man, we take our cuts & shaves seriously, with only the finest products in our hands and the keenest attention to detail. Our Sorbet Man crew consists only of trained and qualified industry professionals that put their Sorbet stamp of excellence on every service they deliver. We are expanding our footprint in South Africa with more Sorbet Man store openings which means more awesome opportunities for you to come on board and join the Sorbet Man Team! 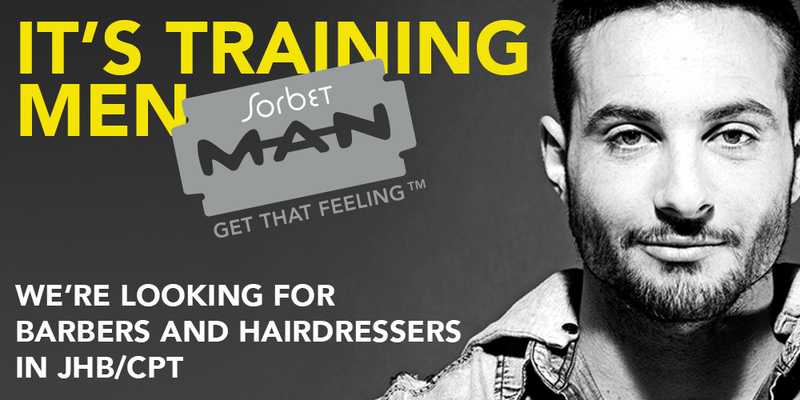 -Training – You will be learning everything from skin care to beard care and how to ‘groom’ the Sorbet Man way. Training is professionally provided by experienced mentors who will guide you along the way. -Skills – We are offering you a job opportunity and a chance to acquire new skills that will provide you with the tools (we are talking blades and blow-dryers!) and tricks (the art of nose waxing and eye brow threading!) of the trade that will essentially ‘groom’ YOU into a fully-fledged barber and male grooming aficionado! Boasting over 3000 employees within the group, we see joining the community as a privilege and not just a job. Ian Fuhr, Founder of the Sorbet Group, refers to the purpose of work as a way to serve, and if we serve well, we will be rewarded. We want YOU to embody this philosophy and come on the journey with us! Do you have what it takes? email: sams@sorbet.co.za now!